Y'all know I love me some DaySpring, and when it came time to hunt for Valentine's Day gifts they did not disappoint! 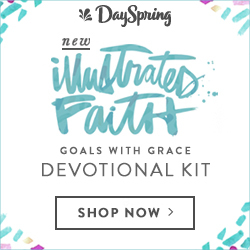 DaySpring has long been a resource for me when it comes to all things Illustrated Faith, but they have so much more to offer! Books, jewelry, home goods, and more, y'all! Goodness galore! I was so excited to put together a gift guide for the upcoming holiday (it'll be here oh so soon! ), and today I'm sharing a few of my favorite finds. First up, the You & Me Jumbo Mug! I'm a bit of a mug collector myself, and this pretty red beauty stands out in the pile of wide ceramic coffee cups I've accumulated over the years. I loved it so much that I actually have it out on my counter holding my favorite teas! 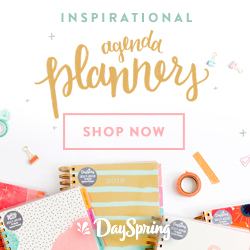 This is a great gift from him to her or back again, and I think it could be made into a fun coffee-date-in-a-cup surprise with a few of your favorite treats and a Starbucks gift card or two. Second, we have the LOVE Letterpress Block Set. You can buy individual blocks to build your own name or phrase, or pick up a pre-made set that reminds you of the love chapter, 1 Corinthians 13, or even HOPE and JOY. I have a few phrases up my sleeve and hope to build my collection so I can change the words at will! This would be a great gift for anyone on your list, and something to be kept for years to come! Number 3 is the first two items in the 5 Love Languages collection, a Journal for 2 and a matching Ready-to-Go Gift Bag! If you haven't read The 5 Love Languages to figure out your own (and those of your family/friends/significant other) you should! You don't have to be dating or married to do so, either. I love the idea of this journal as a way for couples to keep up with one another's thoughts and needs, making it easier to serve in specific ways when one's tank is running low. Plus, isn't it gorgeous?! The gift set continues with a few more options for that special someone: Love Notes, Sticky Prayers, and a Coupon Book. The designs match the journal and gift bag, and they are perfect to gift as a set or individually. A great reminder that the little things matter and can make a big difference! Last but certainly not least is my favorite item on the gift guide, this gorgeous His Word in My Heart Pendant Necklace. A simple heart with a cross along one side says it all: Christ at the center for all to see. It's sleek but meaningful, beautiful but lightweight. I cannot wait to gift a few of these to friends and family oh so soon! Just for you today, use the code 25FORYOU for 25% off your order AND free shipping! You may want to bump up the shipping to get it in time for Valentine's Day, but with the discount it's totally doable! Who are you gifting to this year? I'm actually getting these goals out before the end of the month! Be proud y'all ;) February is off to a running start, and I'm excited to see what the rest of this month holds. The weekend disappeared far too quickly, and while most of you were watching some big football game, I curled up with my computer and a couple of favorites: Finding Dory and Shakespeare in Love. Neither disappointed. It's back to my PowerSheets to map out the month ahead, and this time the goals found themselves color coded and piling up quick. Let's take a peek, shall we? 1. Launch the #psalmsdaybyday challenge. Recently I have been struggling to be in the Word consistently, and I have not made time in my schedule to do as much Bible journaling as I'd like to. At the end of January I got the idea to read a Psalm per day, and it was delightful to find that by starting on the first day of February it would wrap up on the last day of June! I shared the first month's list HERE and have been participating with a daily page in the hashtag HERE. 2. Attend the LIT event by Beth Moore with Annie. This is coming up next weekend, and I'm so excited! Beth Moore announced this one day event back in November, created specifically for women in their 20s and 30s who feel called to write and speak, and it was my Black Friday purchase of choice! Annie flies in Friday, and I can't wait to spend the weekend with her! 3. Direct One Act Play well. It's getting into crunch time for our competition show! With only 3 days of rehearsal per week, I need to be diligent and dedicated to our time and my responsibilities during the week. I want to set my kids up for success and model both fun and professionalism along the way. 4. Create a budget/savings plan. This was put on my list of goals at the top of the month, then yesterday my pastor started a series on money and possessions. Talk about great timing! I want to map out some upcoming expenses for the next few months then really take a hard look at where my money is going this month. If you fail to plan you plan to fail, right? 5. Complete the Entrusted study & dig into Seamless. My other plans for getting into the Word are to follow a couple of Bible studies with friends. Annie and I have been going through Entrusted, and I want to tackle the last of it before the conference this weekend. Jenna and I have recently begun Seamless and I'm loving it, too! 6. Read 5+ books. This one made it back onto the list! Honestly, it will probably make it here every month. For February I plan to read the following books: Glass Sword, Cruel Crown, King's Cage, You Are Free, No More Faking Fine, and Nothing to Prove. Stay tuned for the reviews. 7. Simplify health: Ketogenic research/eating. This month's simplification topic is health, and part of that is simplifying my meal prep to eat ketogenic during the week (and to spend less money on food while doing it). I feel so much better when following this map, and it takes less time once it's all prepared. Hopefully it will go better this month than in January! 8. Make a Goodwill pile/run. Health may be the month's theme, but I still want to make an effort to simplify my things as I go. I have started a pile for Goodwill and want to keep building it and make a big donation at the end of the month. 1. Lesson plans turned in on time. 4. Active 2/3 times weekly. 6. Complete weekly One Act Play task. Here we go! Let's take week 2 by storm and hit the ground running! What have you made happen so far in February?